Miso is a new ingredient in my kitchen. My past miso eating experience has been limited to soup and a few attempts at eating oily miso eggplant at below average Japanese restaurants. The flavour of this curious ingredient is quite appealing to me, so I’ve began my miso experiments attempting to reproduce and improve familiar dishes. I made a very simple soup with white miso, wombok cabbage and silken tofu. It was delicious. My next challenge was to make an eggplant dish with a miso glaze and a soft texture without it being saturated in oil. Because Asian cuisines have developed without ovens, frying or char grilling are the usual cooking methods for eggplant. Eggplant absorbs oil like a sponge when fried and I find that characteristic unpalatable. Inspired by a recipe in Adam Liaw’s “Asian After Work” I simply coated prepared eggplant pieces in a thin film of quality olive oil the baked it. I tossed the roasted eggplant in seasoned miso paste and returned it to the oven to caramelize. It had soft buttery texture and delicious flavour without a trace of oiliness. On consecutive nights we taste tested batches of eggplant separately dressed with white and red miso. Red miso is more savoury then the white variety and an outright personal preference. A handy tip for toasting black sesame seeds is to mix them with some white sesame seeds before adding them to the pan. The black seeds will be done when the white seeds are golden. Preheat the oven to 200C and line an ovenproof tray with baking paper. Cut the eggplants into 2 cm dice and place in a colander. Sprinkle the eggplant slices with salt and allow to drain for 20 minutes. Rinse the salt off the eggplant then pat them dry in a clean tea towel. In a bowl toss the eggplant in the oil, then arrange them in a single layer on the paper lined tray. Bake the eggplants for 20 minutes. Return the eggplants to the bowl, toss the through the miso dressing then return them to the tray. Bake the eggplants for another 10 minutes, or until caramelized. Transfer the eggplant to a serving dish and garnish with the toasted sesame seeds and garlic chives. I find red miso way too salty (white miso is less salty – for me that is the only difference). When you used white miso – did you use the same amount of miso paste? This is brilliant. Love how you roasted the eggplant, then sent it back to the oven to caramelize with the miso paste. I haven’t experimented with miso paste other than miso soup. You have sparked my curiosity. I’m a miso novice too, but I’m loving it! You’ll be amazed how simple it is to use! Aw, thanks John, I guess the range of food I cook just reflects the cultural melting pot that is Melbourne. Thanks for this – I have a tub of miso paste in the pantry that I’ve yet to play with.Now I have some inspiration. Miso, mirin, sake … I’ve never used ANY of these! I’ve seen them often enough it recipes, but for some reason have just never used them. What a yummy mix it sounds though and eggplant is one of my favourites. Oh, and the tip for toasting black sesames seeds is very clever, thank you! I’m just loving Japanese flavours right now and I’m doing lots of experimenting. So few ways that I like eggplant. But that is one! And your picture is making me quite hungry for it. I love eggplant every which way, but baked with miso, it’s especially good! This is a fabulous way to cook with both eggplant and miso. Once you get back into the cooking vibe Laura, give it a try, I’m sure you’ll create something gorgeous with them both. I love Miso too and I often use it in Japanese dishes with eggplant, pumpkin and also salmon in a similar recipe to this. I know Westerners have a preference for olive oil, but I can’t use it in Asian dishes- I feel there is a clash going on, if not in taste, then in my mind. I would use a rice bran oil or something like that. I find rice bran oil froths and spits, probably irrelevant when baking, but it’s put me off. It’s funny, I know, but I tend to use peanut oil in the wok and olive oil elsewhere, just a crazy habit….. I am also gradually trying new recipes calling for miso, and I recently made something very similar, but even simpler: I just coated the aubergine with a mixture of oil, miso, and a little water. I like your flavorful version calling for mirin and sake, and I agree, red and brown misos are the best! A great dish and a nice change from Italian aubergine recipes! I agree Darya, a very light and tasty change to eat Japanese style eggplant. Miso is like magic, making everything it flavours taste good! Sealing the pores of the aubergine before adding oil is a brilliant solution. I’ve also seen cooks in Sicily (home of serious aubergine cuisine) blanch aubergine slices in a pot of boiling water before frying or baking with oil or oily sauces. Below average restaurant = polite-speak for “greasy spoon”? I’ve always loved the flavour of miso and agree, the red stuff is good! I followed a Turkish cooks lead and usually steam eggplant before introducing it to the oil, but this works too, it’s amazing how unctious it becomes. We’d describe a greasy spoon as a cheap take away joint, but many skilled cooks fall down on eggplant, even in a better class of place! 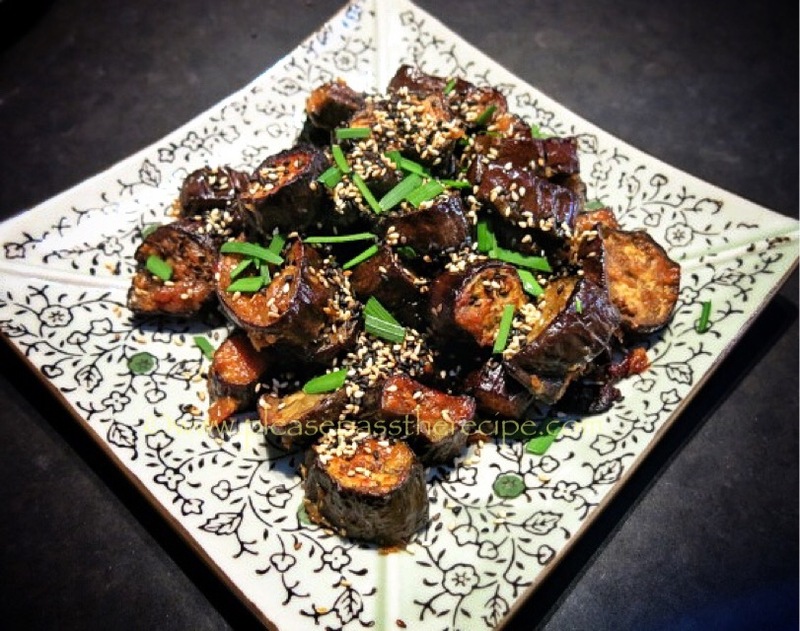 This entry was posted on October 16, 2014 by ladyredspecs in Dairy Free, FODMAP diet, Food, Gluten Free, Light Savoury Dishes, Main Meals, Side Dishes & Salads, Vegan, Vegetarian and tagged eggplant, Japanese, miso.